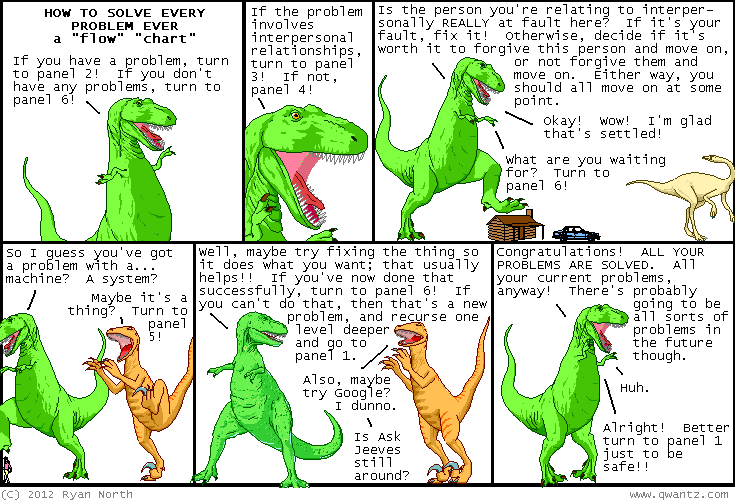 Dinosaur Comics - April 18th, 2012 - awesome fun times! –Oh boy, I see in the distance a villag- CITY that I can destroy!" Also! It's (somewhat delayed, sorry about that) spring footer time! Scroll alllll the way to the bottom of the non-mobile website and you'll see the new footer, which gives us a glimpse inside the Tiny Woman's PARADOX CABIN. It was done by Danielle "Sweet Bike Helmets" Baskin, who wanted to give a shout out to her friend Matt and Steve's awesome stop-motion animation which I enjoyed too and so HERE WE ARE.